Marion "Mike" Petrowicz, 93 of Blackstone, passed away peacefully, surrounded by his loving family after a long illness on Oct. 12. He was the devoted husband of Mary A. (Morin) Petrowicz, with whom he shared a loving marriage of 69 years. 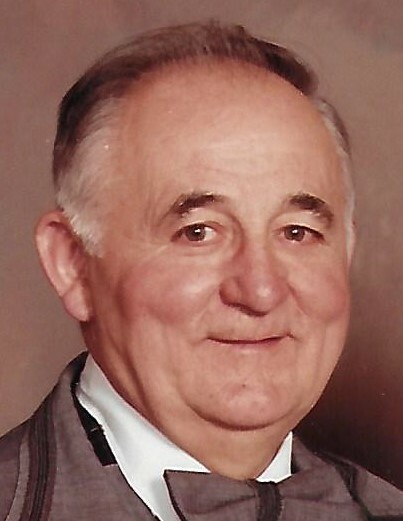 Born in Woonsocket on March 25, 1925, he was the son of Marian and Emelia (Zmudsky) Petrowicz. He was predeceased by brothers John and James Petrowicz, and sisters Stasia Jalowy, Joan Irza and Mildred Cherkes. He is also survived by sons Michael of Cumberland, Robert of Blackstone, and Thomas and wife Lynda of Millville, Also by daughters Mary Eileen Strocky of Blackstone, and Gail Hogue and husband Leonard of Millville. He had 11 grandchildren, 12 great grandchildren, and 3 great great grandchildren, also several nieces & nephews. Marion was a retired toolmaker for the former Draper Corp.of Hopedale, Mass. for many years, and also operated the former Treeland Nursery in Blackstone. He was a member of the Blackstone Conservation Commission as well as being Blackstone Tree Warden. He belonged to the Mumford Council of the Knights of Columbus, was a former member of the Blackstone Valley Coin and Collectibles Club, and enjoyed being an active golfer at the Hopedale Country Club. In his youth, he was a pitcher for the Woonsocket fast pitch softball league along with his brothers, and enjoyed many fishing ventures with them at the local ponds. Later in life he enjoyed hobbies of duckpin bowling, playing cards with the family, and was an avid fan of all the Boston sports teams. He was a faithful communicant of St. Paul's parish in Blackstone. His Funeral will be Wednesday, (Oct. 17th), at 9:30 A.M. from the Kubaska Funeral Home, 33 Harris Ave. Woonsocket with a Mass of Christian Burial at 11:00 A.M. in St. Paul’s Church, St. Paul St. Blackstone. Relatives & Friends are invited. A Visitation hour will be Wednesday morning from 9:30 to 10:30 A.M. before the Funeral Mass.